In keeping with its tradition, with its rich, robust and overall sweeping arrangements, the symphony, for one, breathed new life into these already stellar selections. The careful orchestral work accentuated musical elements that may have otherwise gone amiss, and recreating them in a way that allowed the performers, either vocally or instrumentally, to bring the more subdued aspects of each piece to the surface. As a result, in most cases, almost each number was infused with that unequivocally brassy Pops punch, while in others — of note, the title song from The Sound of Music or Wizard of Oz gem “Over the Rainbow” — we were treated to the arrangement first sung by the original performers in the respective films. Furthermore, as an added bonus, as if these numbers, ranging from “Blue Skies” and “Moon River” to “Happy” and “This is Me” weren’t iconic already, master maestro Steven Reineke peppers the presentations with historical tidbits surrounding each number (Did you know the aforementioned “Over the Rainbow” was almost cut from its film?!). On that note, though, what the evening truly does best in showcasing these spectacular songs in this manner, presenting them out of the context of their respective films, is illuminate each one for what the gems they are as songs in themselves. And in doing that, it allows us to see how much they do, in fact, enhance each film, and how music enhances film in general. Whether playing through a credit roll, serving as a recurring musical theme throughout, providing comic relief, punctuating a climactic scene, or — perhaps especially in the case of Disney — defining an era for a generation, these songs are so much more than bells and whistles inserted for dramatic effect…. and the work of the orchestra helps to exemplify that wholeheartedly. 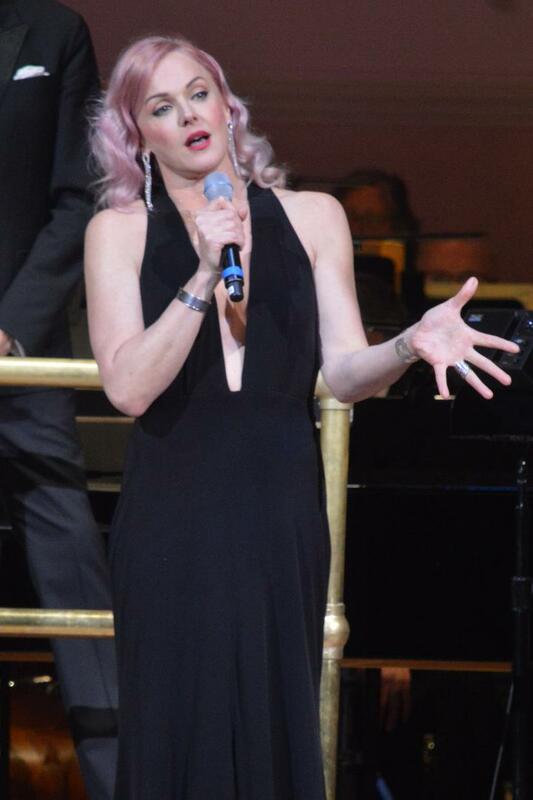 Of course, it sure doesn’t hurt to have them sung by a bevy of beautiful voices doesn’t hurt, and Mykal Kilgore, Storm Large, Laura Osnes and Ryan Silverman do more than fit the bill. 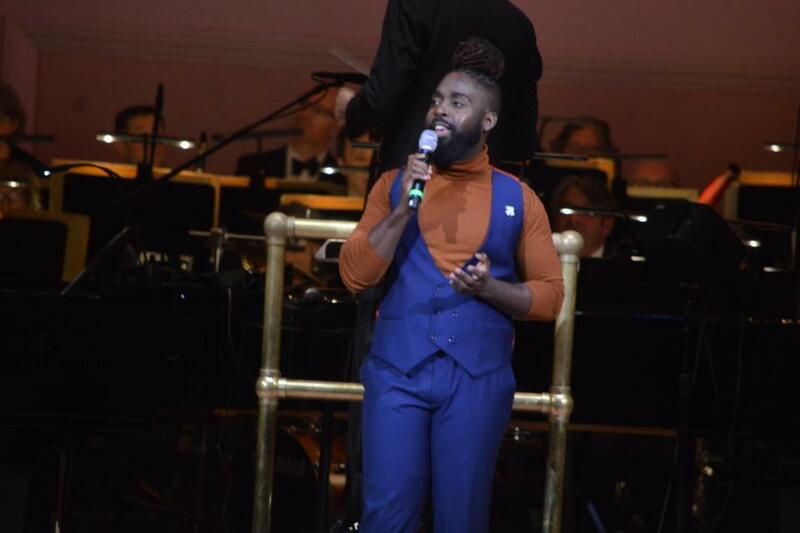 But though each performer was indeed a standout in their own right, accentuating the instrumentals by putting their own trademark spin on the tunes through their voice work, extra-special recognition must be given to Pops newbie Kilgore, making his celebrated venue debut with the performance. Bright and beaming, his infectious enthusiasm is refreshing; in that he’s never played the venue before — ever-appreciative of the opportunity — he’s not jaded in the least. (Not that the others are, but still…) Captivated by his surroundings and truly living in the moment, he walks across the stage with a literal spring in his step, forever frozen in that “I can’t believe I made it!” mentality; it’s simply fascinating to watch. And that’s before he even opens his mouth, which, knowing he’s now got to prove why he was called to be there, produces a timbre that can only be described as heavenly; running and riffing up and down the scale, he pulls out all the vocal stops for his debut. Though he’s a pitch-perfect match for Osnes, as showcased in their stirring duet of The Prince of Egypt’s “When You Believe,” Kilgore truly soars with his rendition of “The Rainbow Connection,” which, by performing, he notes giddily, he’s semi-fulfilled his childhood dream of singing on Sesame Street. 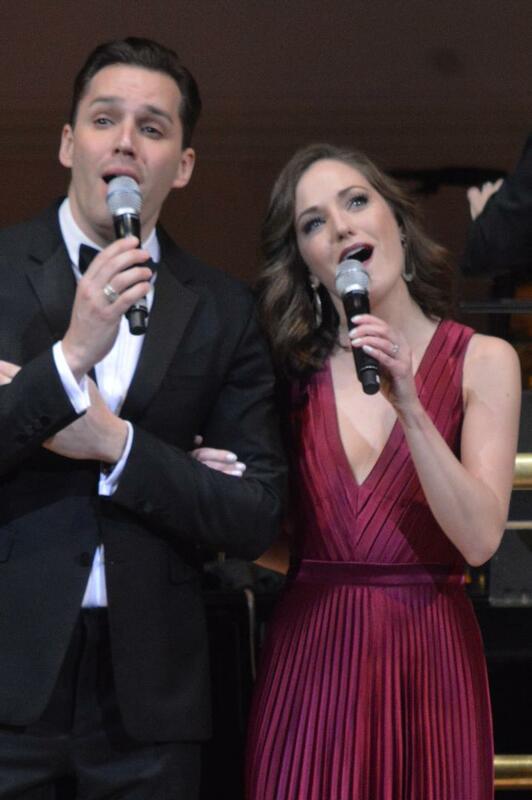 Simply put, there’s no question the roster of performers, whether as solo singers or in pairs, are unmatched in vocal prowess — among the additional highlights, Osnes revisited her princess past and stunned us all with “Part of Your World,” Large, a prominent figure in the recording industry, shook the rafters with a soaring “Skyfall” that rivaled Adele’s, and Silverman got the joint jumping with his rockin’ rendition of “Footloose” from the film of the same name — but the true delight of the evening emanated from seeing them interact as a foursome. They’re playful as ever, palling around with each other on all levels, from wrapping one another in bear hugs, to doo-wooping on the mic to leading us audience members in a rockstar-tinged sing-a-long. In short, the rhythm’s got to them.. they’ve caught the bug, and they’re exemplifying what this music has aimed to do for the last 90 years and beyond: emit joy. That’s indisputably what these films have done, what this music has done, and, in providing us a cheery, lighthearted escape in the midst of these unfathomable times, what the Pops and these artists have done for us. And for that, to quote a line they defiantly declared in their Bohemian Rhapsody-inspired finale, they are the champions indeed. Movie Mixtape: Songs of the Silver Screen, featuring the New York Pops under the baton of conductor Steven Reineke, at Carnegie Hall (57th Street and 7th Avenue). For more information on future performances, visit www.carnegiehall.org or www.newyorkpops.org.